Having spent most of my life in California, I find it more than a little odd that I had never heard “I Love You, California” played even once before Jeep decided to use it in an ad. The lyrics were written by F. B. Silverwood (1863-1924), a Los Angeles clothier, and set to music by A. F. Frankenstein, the conductor of the Orpheum Theater Orchestra. The song was copyrighted in 1913 and was debuted soon afterwards by the opera star Mary Garden. 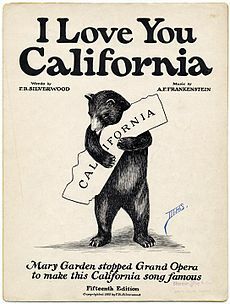 “I Love You, California” was an instant success, and in 1915 became the official song of both the San Francisco and San Diego Expositions. It was also played aboard the S.S. Ancon, the first ship to sail through the Panama Canal. Apparently, the song is still played at the funerals of former governors, most recently Ronald Reagan’s. But wouldn’t it be nice if it were played at sporting events, and if children learned to sing it in school? Perhaps “I Love You, California” could pave the way for a new era of boosterism, one distinguished by a new-found interest in planting backyard citrus, and in naming babies for the greatest state of all. I hella Love Love LOVE……THIS SONG!!!! NO one take my baby name now! LoL This is an awesome article, very informative. I agree! This song should be played all over California, in Schools, Sporting Events, Parades etc. Bring back The Caifornia Pride California Deserves!!! Carmen, that’s how it was for me, too! I swelled with pride to sing that song, because it really did describe the beauty of our state. But imagine my surprise when I heard bits of the melody in this piece written in the 1930s by Francis Poulenc: Sextet for Piano and Woodwind Quintet, Opus 100, the third movement. https://www.youtube.com/watch?v=f1mQJkbv_f8 Poulenc isn’t well known–but he should be! The guy was very inventive and musical, and like a lot of composers, he sometimes incorporated tunes that were popular in his day. p.s. I’m 70 years old now!! Who performs the tune in the ad???? I’ve searched and can’t find the name of the singer, no doubt because he’s a relatively unknown sessions musician. Contary to what a lot of people think, the commercial doesn’t feature Al Jolson (who sang “California, Here We Come) or Eddie Cantor; it’s a new recording with scratches and distortion added to make it seem old. I LOVE this song! I also didn’t even know it existed until the TV commercial. So thank you Jeep! I also like the song, but I HATE the way the Jeep butchers it. In order to fit the song to their commercial slot, I guess, they drop the next-to-last line of each stanza, which means the song neither scans nor rhymes as the writer intended. For this reason alone, I will NEVER buy a Jeep product. I admire your attitude. None of my neighbors would buy a Jeep either, but that’s because the ad has hurt the Canyon. I’m a native Californian, and yet, like so many others, until the ad was run (and I must also give a special nod to Huell Howser’s “California’s Golden Parks” series), I really was still unfamiliar w/ it. The song (along w/ ANY of the state emblems, for that matter) was never taught to the students in the schools which I attended; I had to have a go @ it myself. (In actuality, we are more familiar w/ the songs of different states in the union rather than our very own!) I learned of the title, the song’s creators, and its “an official state song” status when I was @ the age of nine; glanced through a sheet music copy @ age 35; and actually first heard the work @ c. age 50! It sure took a long time to “learn” the song. It’s disappointing that Beachwood Canyon is more disrupted now as a result of the ad. But @ least nowadays, every time I visit the gravesites of the song’s creators extraordinaire – meaning Messrs. Silverwood (lyricist) and Frankenstein (composer – I can’t help but love that name!) – I can’t help but to burst into that tune aloud since I now have the first verse and chorus memorized down pat. In fact, I can’t get it out of my mind! Thx for the article; it’s great to have more publicity generated on this rather neglected melody. Common now, fellow Californians; learn it! I agree that it’s a great song. A good start to popularizing it would be if the Dodgers, Kings and other sports teams played it after the national anthem–I’m sure fans would be receptive. I am a new Californian, since 2008. I love this song too, and agree, it should be played after the national anthem, The Star Spangled Banner. at sporting events from High School to College/University games, to our professional sports games. I think the singer, sounds like Rudy Valle… not Al Jolson.. just saying. Hope he is getting some compensation from Jeep for all the air time the song is getting. I enjoy this particular rendition in the ad. Would love to know who sang it. Me too! It’s a big secret. I Love You California is part of the ritual of the Native Sons of the Golden West. I’m a native Californian, born in 1948. I’m so surprised so many Californians have never heard this song. My aunt use to sing this song all the time. She loved her California and so do I. I wish California was still like it was when I was young!! It sounds like Al Bowlly. You might remember hearing him from The Shining. He sang the closing song “Midnight, The Stars and You”. You are currently reading “I Love You, California”: the Song, the Era and the Ad at Under the Hollywood Sign.